Years ago I saw a recipe for a quesadilla filling in a Martha Stewart magazine that I’ve since adapted for tacos and tortas. I like to make the filling in large quantities and freeze half for later, making a meal down the road that much quicker to put together. You can vary the amount of chipotles you use, depending on how spicy you like your food. In a large saucepan over medium heat, heat the oil. Add onion, garlic, oregano, and pepper. Cook until the onion begins to soften and turn brown on the edges. Add the stock, the juice from the tomatoes, and the chicken. Bring to a simmer, cover, and cook until the chicken is cooked through, about 10 minutes. Remove the chicken from the pan and set aside to cool. Add chopped tomatoes, chipotle peppers, cinnamon, and star anise to the pot and simmer 15 to 20 minutes, until the liquid is reduced in half and more saucy than brothy. When the chicken is cool enough to handle, shred the meat into bite-size pieces. Return chicken to the pot and simmer until it is heated through. Remove the whole spices (cinnamon stick, star anise) before serving. Add salt to taste. To make the tacos, first warm the tortillas. You can fry them in oil if you like, following the package instructions, or heat them on a baking sheet in the oven, or wrap half of them in a paper towel and cook them for 40 seconds in the microwave (the tortillas seem to warm better in smaller quantities, plus your second — and third — tacos will be just as hot as the first if you warm them in batches). 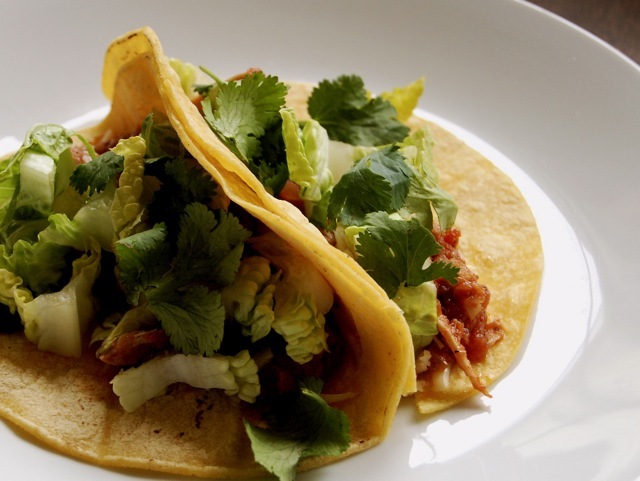 For each taco, spoon some of the chicken filling into the tortilla and top with grated cheese, cilantro, shredded lettuce, and sour cream, if desired.